What have I been doing the past few weeks? Writing papers, going to work and playing a little game I like to call “cram as many Londony things into my last weeks as possible.” So far, I’ve been winning. (Against myself). What was on the list? Fittingly enough, I started last weekend by going to the British library to look at the “British Treasures.” I think the words “British treaures” would pretty much sum up what I’ve spent the past few weeks pursuing. As you can tell from my last post, being in London at a time when so much tragedy is going on in the world has made me feel a little vulnerable, but I know I’m incredibly lucky to be in England and need to make an effort to get out and see everything I’d hoped to before I leave. There’s a lot more to the British library than books. 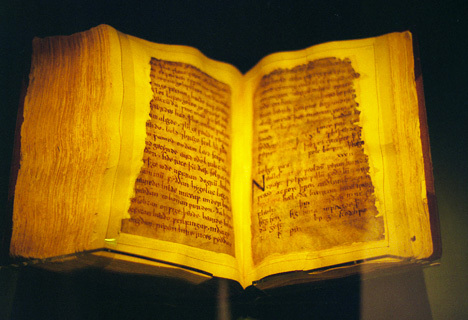 Of course, it does have the original Beowulf manuscript from the 11th century, which somehow survived a fire that charred the book cover. It has Mozart’s wedding contract, which says that he and his wife both cried tears of joy during the ceremony. There’s a tiny Jane Austen writing desk that looks more like a shelf than anything. Beethoven’s tuning fork. The original, handwritten Magna Carta. Scraps of paper the Beatles wrote their lyrics on. The Mendelssohn Wedding March. The world’s first illustrated medical book, and more and more. My roommates asked if my favorite part of the exhibit was the Jane desk, and while it was cool, it was nothing like the original table she sat at. I think my favorite part was seeing the original drafts of work that some of the world’s most famous authors wrote. There were rough drafts from George Eliot, Oscar Wilde and even some early edition Shakespeare papers. All of them featured notes in the margins, scratches through ideas and half-formed sentences. I felt like I got to see part of the “process,” which was pretty cool, and similar across all of the different writers. 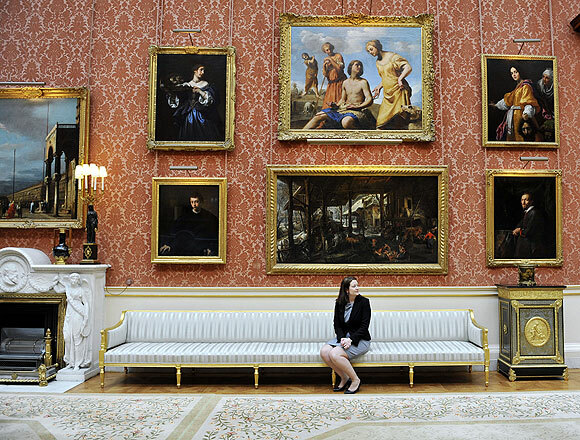 Last Sunday night I went on a tour of the staterooms at Buckingham Palace. 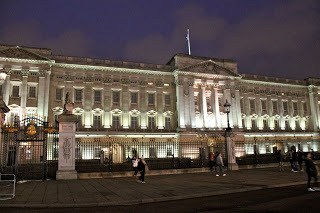 I brought the average age down by about 20 years and was one of the only single people there, but it was still very cool to see London’s most famous palace at night. Of course, no pictures were allowed. I couldn’t even try to snap some because the security was so tight. We had a guide lead us around, but we also had two security officers there to block the doors and keep an eye on us. And the queen wasn’t even home! 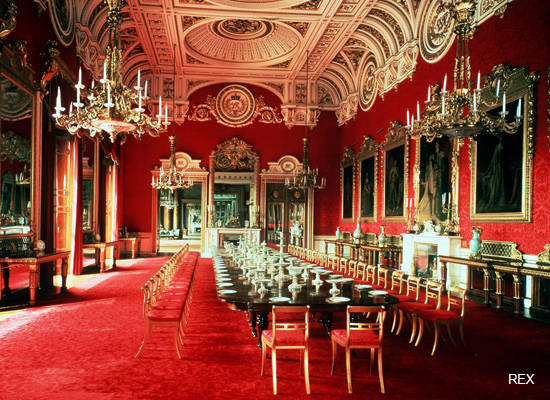 King George IV, a greedy guy that liked to spend a lot of money, acquired the palace. He made it his goal to seek out many famous works out art to feature on the palace walls, so most of what is left is his. He has a table that was made for Napoleon, hundreds of Dutch paintings and rooms filled with gold lacquer designs. I had always heard that the Queen hates the palace, and maybe compared to Windsor it isn’t as “palace-y” or fortress-y. For some reason, in my head the palace was a dim and dingy place that was cramped and ugly. Thinking back, that makes no sense, and Buckingham is truly stunning. 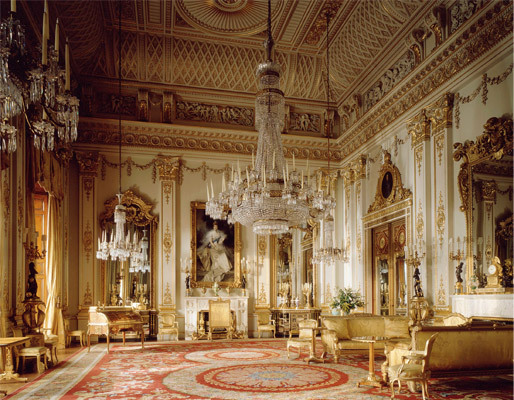 On the tour we got to see the grand dining room, the picture gallery, the room where the royal family takes wedding pictures, the ballroom, the music room and a room with a trap door that the Queen uses to make her grand entrances. (It looks like there’s a mirror and a dressing table on the wall, but the entire wall pulls back to allow the queen to step through. Sadly, they wouldn’t open it more than a crack. Maybe the Queen was really inside). The guides really emphasized how Buckingham is a “working” palace. Although it’s beautiful and full of relics, the staff makes full use of each of the rooms and is even more cautious to keep it clean and put-together. It’s only open to the public on select weekends and during the summer simply because the Queen lives and uses it every day. And no one is EVER allowed inside when she’s there, of course. We ended the tour with a glass of champagne. Of course, I was awkwardly drinking the bubble alone so I got out of there pretty quickly, but it was an amazing “insider” tour and I was really glad I was able to go. 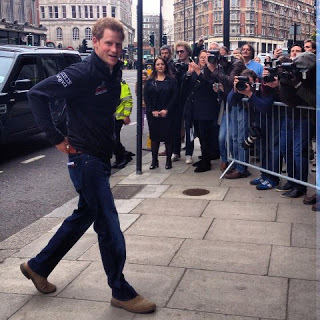 Speaking of British treasures, I got to see the one and only Prince Harry this past Friday! Jessica is a self-proclaimed royalist (read: royal stalker) and found out that he was speaking at a hotel to promote the Walk for the Wounded, which is a charity where wounded soldiers will trek to the South Pole. But, it was thanks to her that we got to see him at all! Harry is actually going to rough it and go with them, but when we saw him his only struggle was keeping his pants up. We were the only girls amongst a sea of photographers, so he looked right at us. The encounter was admittedly brief. He showed up right at 2:30 p.m., got out of the car, looked at us, and continued into the hotel. The whole thing took about 20 seconds at the most. But don’t read too much into it, there was definitely a connection there. Maybe I’ll be the next member of the royal family! My favorite thing I’ve done in the past few weeks is visit the Chatsworth House, which is home to Mr. Darcy in the 2005 version of Pride and Prejudice. That little outing deserves its own post. I mean, you know me by now. Why wouldn’t it?